22 hours after I left home I finally arrived in my hotel in Singapore. I was hot, sweaty and tired and just wanted to lay on the bed and watch TV. The bad news – none of the state-owned TV channels are covering the World Cup – WTF??? 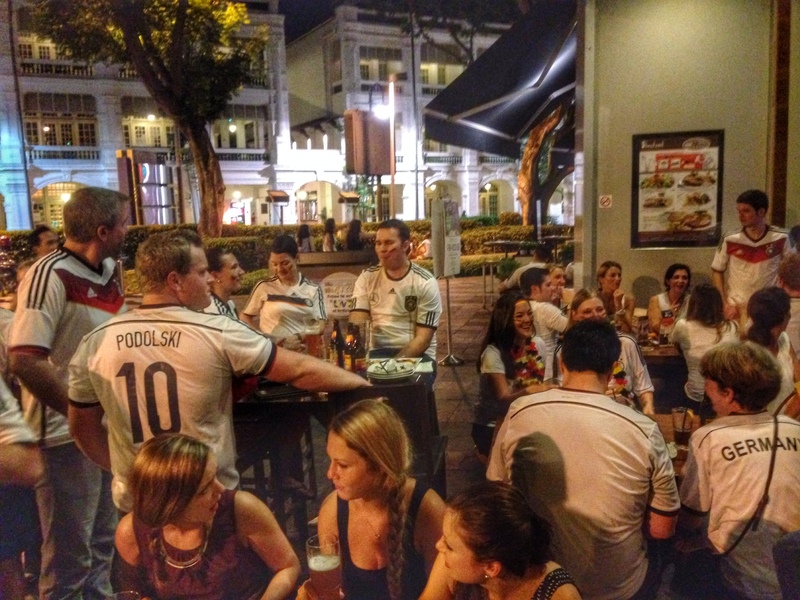 The absolutely fantastic news is that across the road from the hotel, on the corner of Raffles City was a German bar that was certainly showing the game. So I popped over there and joined the pretty young blonde things who were dressed in their German shirts and not much else (it is 34 degrees here at midnight). A couple of $22 German beers later and we were rocking and a rolling. A brave lone Portuguese fan walked in, made some ludicrous claims about Pepe being the best defender in the world, then left. I don’t think there was any doubt that this was one of the games of the Group Stages and I was pleased to be sharing a beer or two with some new German friends. They were confident, if not a bit cocky, telling me, of course, that football was coming home. One even showed me his bet on his phone – German 3 Portugal 0, Mueller to score first. Deluded. 1. Every year the German team is always said to be “not quite good as the last” – Same core of players yet somehow there is always a new star. Everyone thought that Ozil would be the playmaker but those wily old Germans fooled us all and Bayern’s Thomas Mueller dropped back into the whole and bagged himself only the second World Cup hatrick in 12 years. Mueller is still only 24 but has scored 20 goals in just 50 internationals. 2. German fans don’t sing their own national anthem – The bar was rammed yet when the music started up only a couple of them actually sang along. If that would have been England we’d have been on the tables, blood vessels popping showing our national pride. 3. Laughing – Come on, own up. When that fourth goal went in and the camera panned across to Ronaldo looking at his new boots, who didn’t have a little laugh? We all love to hate certain players but today we all laughed….well unless you have him to score first goal at 7/1. 5. Never, ever agree to arm-wrestle a German girl – Even if they are much smaller than you and especially not for a beer. Whilst a nice cold Sagres went down well in the bar of the hotel it was the strong, rich Furstenberg in the German bar that won the day, emulating their performance on the pitch. This entry was posted in Germany, World Cup, World Cups and tagged Germany, Portugal, World Cup. Bookmark the permalink.